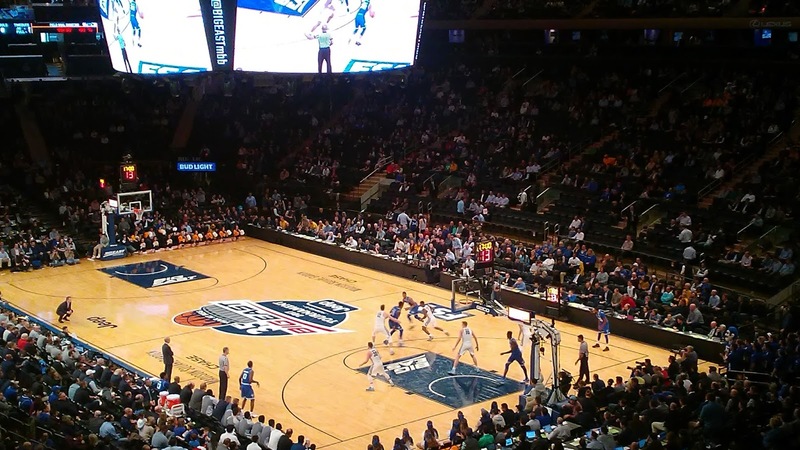 Seton Hall Head Coach Kevin Willard said of facing Villanova again, "Yeah. It's like waking up on Christmas you're all excited, you go down, you open up the present and you've got a bunch of coal. (Laughter) No, they're a fantastic team. They really are. I think Jay, this is his best job by far. I think it's his best team by far. "They're balanced. I think the way (Eric) Paschall is playing is really impressive. It puts a lot of pressure -- it was a difference in our second game. He came out and he banged two 3s. Our game plan was to let him have them and he made them and it was kind of a backbreaker. So I think they're probably the best team in the country, and we're going to have to get to work and figure out a way, but we'll come battle." Marquette controlled this one early, as they had a 30-24 lead at the 3:42 mark of the first half on an Andrew Rowsey jumper. Seton Hall responded with a 9-1 run capped by a Desi Rodriguez jumper with 1:19 left that gave them a 33-31 lead. The game was tied at 35 entering halftime. Marquette took a 42-39 lead on a Markus Howard three-pointer at the 16:45 mark of the second half, and Seton Hall responded with the run that would turn the game. The Hall went on a 12-0 run capped by a Desi Rodriguez layup with 12:15 left that made it 51-42. Seton Hall kept it going and led by as many as 15 points, 66-51, on a Michael Nzei dunk with 4:39 on the clock. Khadee Carrington led Seton Hall with 19 points on 3-11 from the field, 2-3 on threes, and a perfect 11-11 at the free throw line. Myles Powell had 17 points on 4-10 shooting, 3-6 on threes, four rebounds, and an assist. Madison Jones had 13 points on 5-9 from the field, 1-3 on threes, two rebounds, and two assists. Angel Delgado had a double-double with 12 points (6-11 FG) and 16 rebounds, with eight on each end of the floor. Desi Rodriguez had 11 points (5-14 FG), seven rebounds, and two assists. Seton Hall has now won five games in a row. Willard said of having a feeling of deja vu from last year, "No, I mean, I think both years are a little bit different. Each opponent is a little bit different. We've been battling for the month of February and it feels good. I mean, I think the biggest thing in the feeling this year is I think these guys understand the excitement and the importance of the Big East Tournament. So I just think we've been battling for a good month and proud of the way they're playing." This is also Seton Hall's fifth straight win in Big East Tournament play, and Willard said of their confidence entering this year's torunament, "I've said this all year long, I thought we were playing good basketball all year long, even when we were 3-6, he'll tell you, I put up on the board, I think it was against Georgetown, at Georgetown, I said guys our RPI is better, our strength of schedule is better. "We've had a brutal start to the conference season, which I've said about a million times. And I knew that once we could get past that stretch that the second half of the season really looked good to us. "I just kept telling them you've got to just keep believing in what we're doing. We haven't really changed anything. I think the schedule kind of fell into our favor just a little bit more."